The Pacific region of the United States is the only region in the country where all the member states have access to the ocean. This has led to sustained economic growth for each of the five states that compose the region. Alaska, California, Hawaii, Or﻿﻿ego﻿﻿n, and Washington make up the Pacific region. Some of the largest cities in this region include Los Angeles, San Francisco, San Diego, Portland, Seattle, Spokane, Anchorage, and Honolulu. With exceptionally strong technology and agriculture sectors, California has the sixth largest economy in the world. Oregon is one of the world’s leading producers of timber and is also home to the biggest athletic-wear company in the world, Nike. The state of Washington is home to enormous companies like Boeing, Microsoft, Amazon, and Starbucks. Due to its abundant natural resources, Alaska has a strong economy based in natural gas, oil, and fishing. Hawaii has become a major agricultural producer, while also maintaining a strong tourism-based economy thanks to its natural beauty. In addition to all of their respective economic niches, each Pacific state also has quick access to the markets of Asia and Australia. Seemingly a haven for economic prosperity, LendEDU wanted to see how each and every town and city in the Pacific region was faring financially. To do this, we licensed Experian’s Premier Aggregated Credit StatisticsSM dataset to find the average credit score of each Pacific city. Average credit score can provide a reliable economic outlook because cities with a high a﻿﻿verage credit score usually experience rising incomes, falling unemployment, and a decreasing number of defaults on loans and mortgages. After evaluating over 2,200 towns and cities within the Pacific U.S., our final list recognizes the 250 cities in that region that had the highest average credit scores. Which Pacific states had the most cities in LendEDU’s top 250 overall? 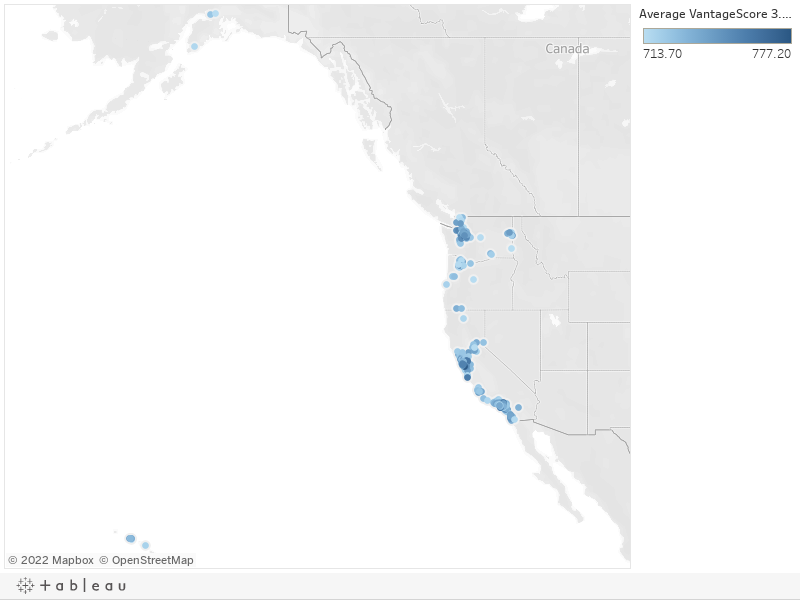 Which Pacific state had the best average rank based on their cities that made the top 250? Which Pacific state had the best average credit score based on their cities that made the top 250? All data used in this study is under license from Experian and Onboard Informatics. Onboard Informatics’ dataset was used for the most recent population figures and location purposes. Experian’s Premier Aggregated Credit Statistics dataset was used to find the ﻿average﻿ VantageScore 3.0®1 credit score for every single town and city in the Pacific United States. Over 2,200 cities and towns in the Pacific U.S. were evaluated based on their average credit scores. A population cutoff was implemented at 7,000; any town or city with a population below 7,000 was taken out of consideration. Every city in the Pacific U.S. was given an average VantageScore 3.0 credit score. The greater the average credit score, the higher a city was placed in the rankings and vice versa. The 250 Pacific cities featured in the report were the 250 cities in the region that posted the highest average credit scores. 1. VantageScore® is a registered trademark of VantageScore Solutions, LLC. 2. Experian is a nonexclusive full-service provider licensee of the United States Postal Service®. The following trademarks are owned by the United States Postal Service®: ZIP and ZIP Code. The price for Experian’s services is not established, controlled or approved by the United States Postal Service.